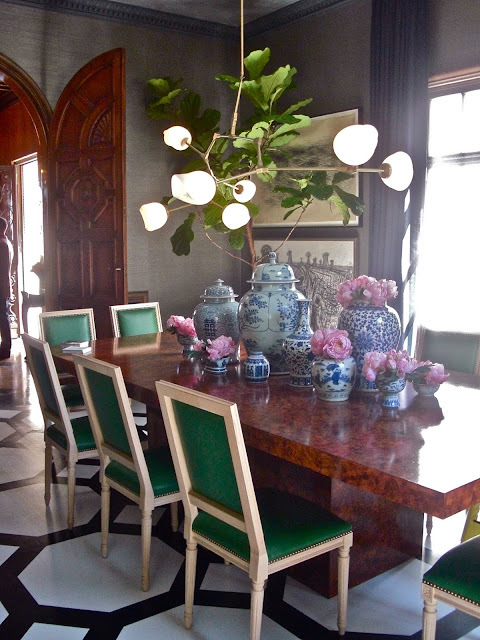 I haven’t been to the San Francisco Decorator Showcase in a couple of years, which in my opinion, is one of the great showhouses in the country. It seldom disappoints. This year, the dining room by my friend, Grant K. Gibson is no exception. 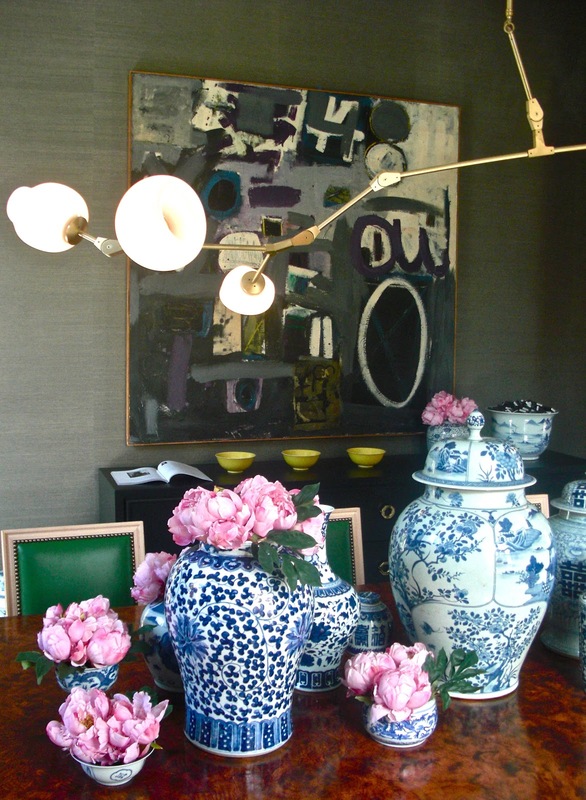 Grant’s bold design draws from several styles and eras for a space that is eclectic, layered and uber chic. You’ll notice several bold touches, such as the amazing painted floor, the beautiful abstract painting (I’m in love with this piece), and the gorgeous green chairs. The modern chandelier by Lindsey Adelman studio has an almost organic quality to it with its free-form shape. Beautiful colors. I'm in love with the green and yellow chairs. They're really fun! This room is very inspiring, Paloma. Yes, the green chairs are an eye catcher...have an inviting appeal. I love the floors and definitely those chairs make the room! What a lovely Friday morning surprise to wake up and be featured on one of my favorite blogs! This room was so much fun to design. I really wanted to play with color, styles and textures. This is a very inspiring room from the gray wallpaper coverings to the beautiful emerald green dining chairs. The whole vibe of the dining area is very eclectic and refreshing! Just gorgeous in every way! Yup- could not possibly get better- adore!! I did a post on this rom earlier in the week, but I'm glad you're showing some angles I haven't seen before. Only wish I could see the room in person! 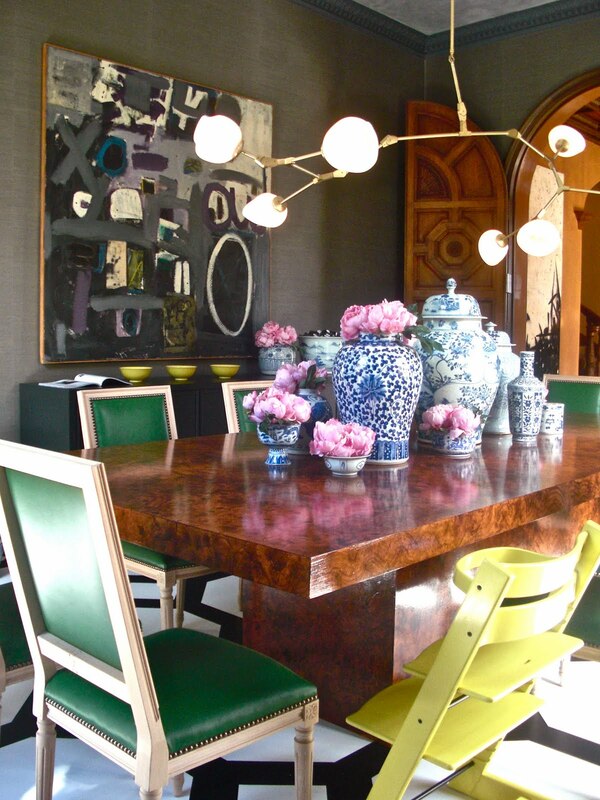 Wow, this is a gorgeous dining room! Love the chandelier!! I love this set up by the way - I really really wanted to incorporate blue/white chinoiserie porcelain into my wedding but it didn't fit into my color scheme :( This lokos so gorgeous and love the florals! Hi Paloma...just wondering who did the abstract painting? I love it too. Blown away by this room - takes a dining room that is prob in a huge mansion and makes it feel so young, fresh, comfortable, and family friendly. Love! I love Grant's room. That light fixture is fabulous! Love the emerald green chairs. They balance the strong floor nicely. Love those showhouses - so many great ideas.